Last (and yes, least), here is a video of yours truly doing The Walk. Sure, it's not a great video - none of my videos are great productions, but you can tell that I'm a really tough guy because you have to be tough to wear a shirt that says your name is SUE! 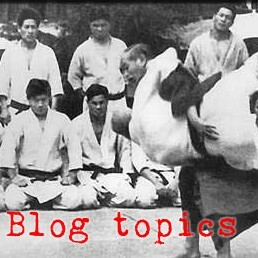 Links to previous articles on The Walk - nanameashi, wakiashi, tenkanashi, shomen tegatana, soto mawashi, uchi mawashi, uchi-soto gaeshi,uchi mawashi gaeshi, soto mawashi gaeshi, koshi kaeshi, and omawashi. 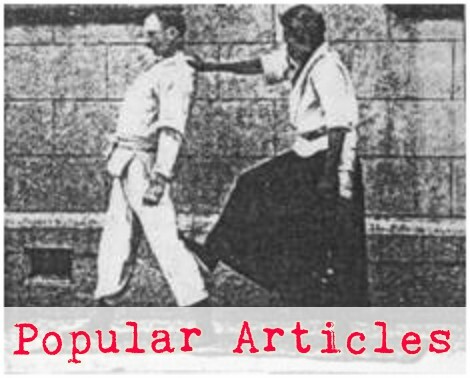 If you're looking for practical techniques that look like this, sometimes kotegaeshi looks a bit like this, and this also greatly resembles a cool way to splatter someone that is shooting at your knees for a leg pick. More than looking like particular techniques, I think that we use this motion as a contrast to the other movements - we usually do all the other motions small and conservative and this one shows some of what happens when you take a much larger than normal step. It also suggests to us that we should every so often practice all the other stuff in larger-than-usual mode. This is an experiment to see all the places that we can put our centered, unbendable arms by moving hips and feet instead of arms. I also like to use it as an experiment to see where you can move shoulders and arms and hips without moving feet. Yoko omawashi also serves as a no-impact strength and flexibility exercise for the legs and hips. That's the last of the move-by-move breakdowns, but hardly all that can be said about The Walk. I figure to have a couple of summary posts, so stay tuned and I'll try to get this thread finished this weekend so we can go back to talking about how to trash bozos properly.